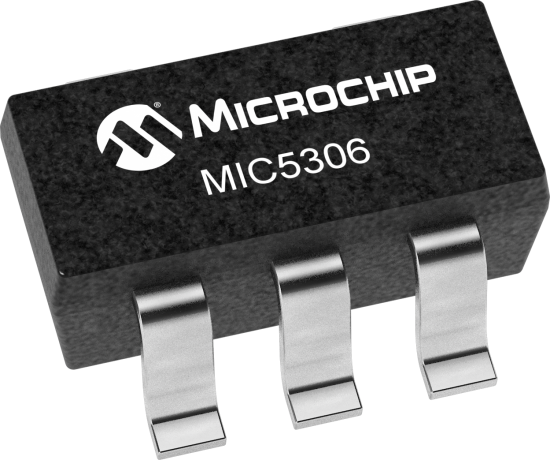 The MIC5306 is a micropower, µCap low dropout regulator designed for optimal performance in a small space. It is capable of sourcing 150mA of output current and only draws 16µA of operating current. This high performance LDO offers fast transient response and good PSRR while consuming a minimum of current. Ideal for battery-operated applications, the MIC5306 offers 1% accuracy and extremely low dropout voltage (45mV at 100mA). Equipped with a TTL logic-compatible enable pin, the MIC5306 can be put into a zero off-mode current state, drawing no current when disabled. The MIC5306 is a µCap design, operating with very small ceramic output capacitors for stability, reducing required board space and component cost. The MIC5306 is available in fixed output voltages in Thin SOT-23-5 packaging.